I will never understand people who go to different countries and spend all of their time behind the walls of a resort. I absolutely understand people who go to Jamaica and never leave a resort. I just disagree with them quite intensely and feel the need to question their fears, motivations, and general attitudes toward people of different cultures and socio-economic levels. Because if you’re afraid of Jamaica (or Mexico, or any inner city in the United States) that’s on you. Yes, there’s crime in Jamaica. And in Mexico. And in my neighborhood. And even out in the mountains of Pennsyltucky. There’s a whole world out there where people look and sound and think differently. That’s why you travel. It’s not a reason to stay away or lock yourself up in a resort. So, down off my soapbox. People will claim that they want a resort for the relaxation. All I will say is go to Treasure Beach. You’ll be really relaxed, verging on comatose. We’ve been twice at this point, and we’re trying to figure out whether we should ever bother going anywhere else on spring break. It’s that great. Treasure Beach is a series of bays on the south coast of Jamaica and describes itself as “the home of community tourism.” Their branding is accurate: it’s a treasure and you will feel like a part of the community. The best known place in Treasure Beach is Jake’s Hotel, and that’s a pretty great claim to fame. It’s a really wonderful, quirky property that defines “boutique” while still being accessible to the community at large. If we were into hotels we’d stay there in a heartbeat, but even if you don’t like hotels it’s worth a stop because the food is good, the drinks are strong, and you will feel welcome. Frenchman’s Bay. This is the hub of beach activity, with a few hotels, some restaurants, and some world-class beach shacks for drinking and eating. This is the BUSY bay of Treasure Beach, which gives you an idea of how peaceful it is. Calabash Bay. A little quieter, with villas and guest houses and a lot of fishing boats. Old Wharf. A quiet area full of villas, with a scalloped coastline that is wavy in some areas, sheltered in others. Great Bay. We’ve never made it quite this far because it’s a really long walk, but it seems to take peacefulness to the next level. Jamaica has two international airports, in Montego Bay and Kingston. You’ll want to go to Montego Bay for Treasure Beach (and for most other areas of Jamaica except for Kingston itself and maybe Portland Parish). Getting to Treasure Beach takes a while–it’s a solid two hours from MBJ, going up and over the spine of the island and down along the beautiful, peaceful South coast. The closest big town is Black River, which goes back to the 17th century and has some relatively old surviving buildings, along with the area’s largest groceries and the river itself. So how do you deal with this drive? Just contact Treasure Tours. In fact, just contact them for most things, they’ll hook you up and make sure you’re happy. They have a team of great drivers, will take you on tours, represent a bunch of villas and guesthouses…and they’ll keep checking in to make sure you’re having a great time. It’s a wonderful company. They will even arrange to have one of their drivers change money for you at a really good rate. Accommodations are available at all price points from all of the usual suspects: VRBO, Airbnb, Booking.com, etc. But you can also zoom in on the Google maps and find a bunch of smaller places that can be worth checking into…Shakespeare Cottage, for example, is very centrally located, has rooms as low as $26 a night, and seems to have many repeat guests. In March 2016 we stayed at the Moringa Ingadi Village (hosted by Jayne), just a few minutes from Frenchman’s Bay. It was a wonderful place, quite new at the time, and just a great setup for a group of friends. We needed four bedrooms, so we took Frangipani House and the Moonflower Treehouse and we were quite happy with the accommodation. We had very comfortable rooms, several lovely gathering areas, and a fridge to hold the Red Stripe and mixers. Mission accomplished! We spent our time eating, drinking, swimming, wandering, and adventuring. Moringa Ingadi is a five minute walk to Frenchman’s Bay so we went down every day and battled the waves (it was pretty rough that year), or varied the routine with a walk to the other bays, or took a tour. And of course we spent a lot of time eating and drinking, because Jamaica’s one of those places you could go to just for the food. And speaking of food: go to Smurf’s. Treasure Beach has a bunch of restaurants, but for breakfast (and perhaps some dinners, and to have a cake baked for a special occasion), go to Smurf’s. Miss Dawn roasts her own Blue Mountain coffee in a cast iron skillet and serves ridiculously large Jamaican or U.S. breakfasts for around JA$650. And it’s delicious! There are two big ones you really should do from Treasure Beach: YS Falls and the Appleton Distillery and the Black River and Pelican Bar. They’re both a pretty full day and are both absolutely worth it at about $50 a person for each day (with some extra for food, drinks, and admissions). YS Falls is just a gorgeous place, with a bunch of waterfalls in the rainforest, a zipline, rope swings into the water, and some nice pools and decent food. The water is a little cold for me, so I spent my time wandering around looking at the plants and people watching. It’s not too hard to combine with Appleton, which is fairly old and historic. They really know how to do a tour: they start you off with rum punch, then take you through the process with very engaging guides, and finish you off with a generous tasting session. We did buy some booze there, but it’s not absolutely necessary…and the amount you have to drink pretty much covers the cost of admission. But the drive itself is great. On the way to the falls you pass through a village where the main business is selling spicy boiled shrimp. The plantation with the falls also is a working farm with cows and thoroughbred horses (which seem pretty happy in Jamaica!). Then between the falls and the distillery you pass through a bunch of villages and cane fields and drive down Bamboo Avenue which is just as nice as it sounds. So now we get into a really crazy and wonderful adventure. I’ve talked before about wanting to go to the Pelican Bar, which is driftwood held together with zip ties and rusty nails on a sandbar hundreds of yards offshore. You can just catch a ride on a boat out there, or you can combine it with a trip up the Black River. Take my advice: go up the Black River. Make them take you all the way to Sister Lou’s for crabs. Sure, have a drink at the Pelican Bar on the way back, but the Black River is amazing. But we didn’t really know all of that the first time we went, when we went with High Grade. We asked Jayne and Carlisle the best way to do it, and they hooked us up with High Grade, their neighbor on Parottee Beach. Instead of grabbing a boat from Frenchman’s Bay, we got a ride up there and found High Grade…owner of an old wooden boat, proprietor of the world’s smallest beach bar, and sound system aficionado. High Grade’s boat on Parottee Bay. After a lot of preparation and a few Red Stripes, we went up the Black River, looking at crocodiles and mangroves and some guys who were illegally spearfishing. We didn’t make it all the way up to Sister Lou’s, but we loved it. Then we went out to the Pelican Bar, but the water was rough and they appeared to be closing up, so we just went back to High Grades for beer, fried fish, and the sunset. And yes, we were the only people there. Oh, Tortola. So green, so steep, so lovely. So very, very boozy. I’ve been going through pictures trying to find some good ones from Tortola and coming up short–which is odd, because it’s really quite photogenic. It’s the steepest of the Virgin Islands, going from sea level to over 1700 feet in almost no time, and with exactly the kinds of roads that the geography would imply. Crazy roads. We hit pretty much every corner of it while we were there, so that’s not the reason either. We stayed on Cane Garden Bay, went out to both ends of the island, spent an hour or two in Road Town…so, we got around. I think the reason it’s so poorly documented is that we were hung over. I blame Cane Garden Bay. We stayed at a super budget but very comfortable apartment at Columbus Sun Set, which really worked well for us. A little too well, in fact. We often stay in places where you need to drive to go out for dinner, which tends to make you a little more cautious about your rum punch intake. By staying on Cane Garden Bay, we could walk down the beach to a bunch of different bars and restaurants, and so we did. Honestly, we are too old to bar crawl but we got into the spirit of things. Thus the title of this post, which is now one of our many inside jokes. Staggering down the beach at night after hitting several bars, looking at the moon shining on the water and watching the boats bob around, I kept saying, “It’sh sho bootiful.” And it was. We love to try new places, but sometimes you’ve just gotta go where you know you’re going to have a great time. It happens on purpose, when you just don’t want to be thinking and planning. And it happens by accident, when you are thinking and planning and discover that your best, least expensive option is to go back to a place you love. That’s why we went back to the British Virgin Islands in November 2015. It was just the best, cheapest thing we could do, with cheap airfare to St. Thomas and very reasonable lodging before the start of the high season. We started with three nights on Virgin Gorda, because why not? Anytime you can go to Virgin Gorda you might as well just go to Virgin Gorda. We weren’t able to rent a dinghy and putter around the North Sound on our first trip, so we called in advance and reserved one, then booked a hotel room at Leverick Bay Resort & Marina. I know what you’re thinking. A hotel room? Really? But it had a coffee maker and mini-fridge, was a hundred yards from the dinghy dock, and was only for three nights. And this was the view! That island in the middle of the picture is Moskito Island, where the Obamas stayed a little over a year later. Leverick is not the fanciest, but it’s a really fun place nonetheless. You can rent a dinghy or a bigger boat and do some adventuring. They have a really decent set of food options–fine dining upstairs, beach bar and casual restaurant downstairs. There’s even a really nice little store. All the rest of Virgin Gorda is 15 or 20 minutes away. It is not a big island! You can just sit on your balcony with a Carib and watch the boats go by. So here’s what’s funny. We laboriously made our way to Virgin Gorda (such a beautiful ferry ride, but I fall asleep every time) and go down to the dock the next morning to confirm our dinghy rental. What did we end up doing? Cancelling the dinghy and booking an all-day, five stop snorkeling trip. What can we say? It was a really great deal. Something like $125 each and literally all day, 8:30 to around 4:30. With that done, we went back to some of the better places on Virgin Gorda, especially Spring Bay. Spring Bay has got the beautiful rock formations of the Baths, with about 10% of the people. So, a side note: I have a tendency to be an annoyingly good orderer. Somehow I almost always manage to order the best thing on the menu, and for a certain kind of person (mainly my mom) it eventually becomes kind of annoying. On this particular trip I kept eating hot dogs for lunch, and every single time they were better than Buck’s order. The one at the Yacht Harbor that day was one of the better hot dogs ever (it really helps when you’ve got a good view). The next day we started out from Virgin Gorda bright and early, stopped at first off of Cistern Point off of Cooper Island for a snorkel, and then went to Cooper Island for coffee and snacks. Love that place. Then we went to the Indians for snorkel number two. I think they’re probably the best snorkeling in the BVI (and maybe all of the Virgin Islands, including the U.S. ones). Then for our third stop we had lunch at the infamous Willie T. It’s currently busted up on the shore post-Hurricane Irma, but it had a long and storied history of drunken escapades. People would strip and jump off the top deck. Yep. From there it’s almost swimming distance to the caves on Norman Island, which is perhaps Treasure Island itself. Look it up, there was actual buried treasure! They get very crowded, but were much better than I expected. Look, I’m in a cave! We had two more stops, both of which were much more unexpected and uncrowded: Peter Island and Fallen Jerusalem. Of those, Fallen Jerusalem was the most wonderful and unexpected. It’s an uninhabited rocky island, near the Baths and very similar in feeling. In one bay fisherman used to stop and drop off all of their conch shells and there are huge mounts of them everywhere. There was no one else there. No one. So that’s five stops, and what a day it was! 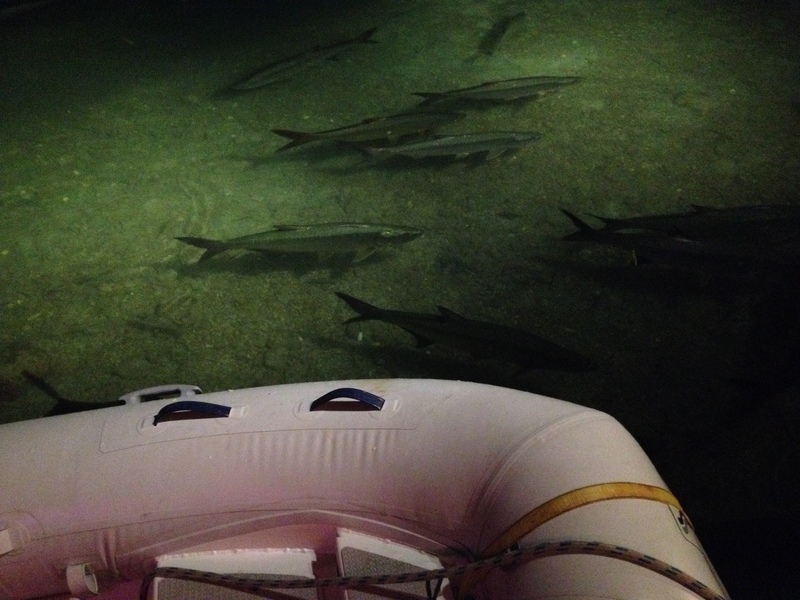 We were waterlogged and exhausted, barely able to drag ourselves down to the beach bar for food. But the next day we were off for Tortola! Sassalbo. Yes, the mountaintops are in the clouds. So given all of that, it’s no wonder I had no idea where her chunk of the family was from. Tuscany was all I knew, and it’s the largest province in Italy. Luckily, my grandmother’s sisters may have been a little more forthcoming. One of my dad’s cousins went to Sassalbo, my great-grandmother’s village, and pointed us in the right direction. It was just spectacular. It’s easy to picture Italy as a conglomeration of all the stereotypical places and things, even though they’re so diverse. Ruins and gondolas and Renaissance cathedrals and a bunch of pictures of the Madonna. You could spend years and still only hit the highlights. And then there’s Sassalbo, so far off the beaten track that there’s not even a real signpost. Sassalbo is in the Lunigiana, a mountainous region in the very northern part of Tuscany, known for its castles. The entire region is almost unaffected by tourism despite its incredible beauty. When I Googled it prior to the trip the main results were about UFO sightings and trekking through the Apennines with pack mules. And having been there, it all makes sense. It is wildly and beautifully remote, exactly the kind of place that lends itself to a shared delusion, whether of lights in the sky or the enjoyability of spending time with mules. We drove through the rain, up and up on a windy two lane road full of switchbacks, and drove right by it into the heart of the national park of the Appennino Tosco-Emiliano. Realizing we missed it, we turned around and tried again. No luck. We had wanted to try the Albergo Giannarelli because my great-grandmother was a Giannarelli. Unfortunately, we kept missing the turnoff and finally stopped along the main road and ate the closest thing to my grandmother’s ravioli I’ve ever had. We were about to admit defeat and continue on to Milan when we finally found the turnoff. The streets are too narrow for cars, so you have to park on the outskirts and walk. Everything is made of stone, and even the houses that aren’t maintained show the craftsmanship involved, as the stones continue to fit together without mortar. We spent a lot of time walking, looking at the view of the white rocks (derivation of the name Sassalbo), and just plain snooping. We saw maybe one or two people the entire time, plus a dog. But there were a few gardens, the sound of rushing water from down in the valley, a pony cropping grass on the hillside, and everywhere the old stone houses and walls, crumbling or patched together, with ferns growing out of the mortar. It’s easy to see why people left, and also easy to see why they would miss it forever. There is nothing there. Nothing. No way to earn a living at all. But the greys and gold of the stone walls contrasting with the vibrant greens of the plants and hills are so ridiculously, deeply, deliciously beautiful that they affected us unlike anywhere we’ve been. All travel is life-changing, even if it’s just in little ways. The new experiences and sights and smells and food make you come home a little different from when you started out. If you’re fortunate enough to be able to travel frequently, all those little changes really start to add up. This is true for all travel, but it’s really noticeable when you drive around Italy for a week. When Buck starting getting grumpy about not having any trips lined up and we started looking into alternatives to the Caribbean, I did my initial research by checking out a company my mom had used in the past, Gate 1. They do a lot of package tours (if it’s Tuesday it must be Turin type stuff), but they also do some packages for independent travelers where you get a flight, hotel, and rental car. It was really inexpensive so I bit, but we won’t do it again. Why not? Because I’m a control freak. The whole idea of putting it all into someone else’s hands just bothers me. Plus, there were some weird issues…the airline changed our flight times and I didn’t find out until weeks later. Our hotel changed at the last minute. Stuff like that. Nevertheless, it really was an extremely inexpensive way to have a grand adventure and it’s hard to pass that up. One of the main ways that they seem to make it inexpensive is that they fly in and out of Milan Malpensa (bad thought! best airport name ever) and you drive down to Tuscany. Malpensa seems have slightly less expensive flights from the U.S. than many of the alternatives. The other way they make it inexpensive is that you stay in Montecatini Terme–not Florence or Siena or a similar expensive city. It worked for us, at least for a short trip. Many people seem to be intimidated by driving in Italy, but those people are probably afraid of just about everything. I loved driving in Italy. The drivers are great. The roads are great. The tunnels are great. They even have the best highway rest stops I ever expect to encounter. This Autogrill spans the highway! It may not look exciting, but they actually have good food and serve your espresso in little china cups. That doesn’t mean that you shouldn’t study, or that you should drive everywhere. No matter what country you’re going to, you should always research signs, signals, everything. Just as an example, in Italy they have color coded parking spaces and if you park in a residents’ only spot you’re going to get a ticket. Good to know, right? But the big thing to watch out for is ZTLs: Zona Traffico Limitado. Almost every city or town has limited traffic zones, marked by a big circle, and if you drive though you will get fined. If you then exit and drive through again at another spot, you’ll get fined again. So you need to pay attention, park on the outskirts, and walk–or take a train. The other thing that’s interesting about driving in Italy is that enforcement is almost entirely by camera. They are watching you, and they will send you a ticket instead of pulling you over. If you’re in a rental car, they pass the ticket through the agency and it might be six months or a year later. It’s been more than a year, so I think we’re good! I’m talking a good game about driving in Italy here, but I have to admit that when we picked up our Peugeot 208 Diesel (a really great little car) I was a little intimidated. It was around 9 a.m. and we had been in a plane all night and our phones were on airplane mode. We ended up driving around the airport roundabouts a couple of times, taking the wrong exit, then backtracking the whole way and starting over. But once we were on the Autostrada it was amazing! The main north-south highway has around six lanes in each direction when you’re near the major cities, and people absolutely follow the rules. No one hangs out texting and driving 45 miles an hour in the passing lanes. Trucks keep to the right. Everyone’s driving fast, but they’re driving well. It makes a big difference! We were so cautious that a Smartcar passed us, but by the end of the week I was hitting 135 km/hour and worrying about having a ticket mailed to me. There are a bunch of different ways to go from Milan to Tuscany, and we did the oddball one both ways: we hopped off at Parma and headed through the mountains to the coast. I’m sure that heading down via Genoa and being along the coast for most of the trip is really cool, but the mountains were amazing. Someday I need to drive in Germany for comparison, but Italian roads are the best I’ve driven. Their tunnels are absolutely spectacular. They’re long and twisty and you’re allowed to pass, but for some reason it feels easier to maintain your speed than it does in our many local tunnels. What an oddball town they put us up in! It’s a spa town (that’s what Terme means) that’s mostly relatively new. On the other hand, it’s on the main highway (and train line) that runs from Florence to Pisa. It’s really easy to get just about anywhere in central Tuscany from there, and that made it a great place to sleep. We even spent one day wandering around Montecatini Terme and taking the funicolare up to Montecatini Alto, the ancient village. It was an incredible blast and makes me wonder why I don’t ride the inclines here in Pittsburgh. They’re really just funicolari! Yep, I’m going to be that person. The one who calls Florence Firenze. We started fairly slowly on our first full day in Italy, a little beat up by travel and by the prior night’s wine. But we did manage to make it to Firenze for lunch at the Mercato Centrale (fun, tasty, and worth it, if a little touristy) and then walked for hours and hours. We didn’t bother with the Accademia or Uffizi, largely due to lack of patience with lines, but did get a great introduction to the pleasures of walking around a great Italian city, looking at sculpture, and eating gelato. Brunelleschi’s Dome. You just turn a corner and there’s one of the most significant architectural and engineering achievements of all time. Italy has the best graffiti. Yep, there’s a lot of sculpture. One of my favorite things! This window at Ferragamo holds the custom shoe forms they used for old time movie stars. Katharine Hepburn! Ingrid Bergman! And the shoes are gorgeous to this day, love the platform sandals at the top left. More than once during this trip I wanted to stop, resign my job, and spend weeks just wandering the streets of a particular city. The feeling was strong in Siena. It was individual and eccentric in a way that few American cities manage (although we do live on a unique and eccentric place ourselves) and it generally just knocked me out. We got there in a good way, too–driving through the heart of the Chianti region, looking at grape vines and olive trees. Then when we got to the outskirts of Siena we got all fouled up, parked too soon and got lost, got back to the car and drove some more before managing to get a totally rockstar parking spot right outside the ZTL. The whole place was just gorgeous, from the Campo to the Duomo. It’s small, but I could spend a lot of time wandering. You can’t tell from the picture, but there’s a gorge around the old city and you need to cross a bridge to get there. It just felt older than Florence. I have a habit of taking pictures of birds on statues. Wait until you see my pictures from Rome. So yeah, this is a floor. To walk on. Siena’s Duomo may be the most decorated building I’ve ever seen. Saints, apostles, and a wolf suckling a couple of babies. If your cathedral doesn’t have a cow or two it just isn’t doing it right. A gelato a day? Maybe more than one. This is one of the lesser known cities in Tuscany (although that might be changing) and was one of our absolute favorites. It was just so great, even in an incredible downpour that kept us from renting bikes. It was an easy half hour drive from Montecatini, we found a great parking spot, and we had a great lunch. So there’s three good things! And it was just really cool–it felt perhaps even more ancient than Siena, thanks to the watercourses and the piazza that was on the footprint of a Roman temple. And their Duomo was spectacular! I want to go back and wander around for days. St. Michele. It’s a very see-through church. Every column and pediment is different, just because. Lucca is very proud of their tower with a tree on top. Nowhere else had such mossy statues. The watercourses had little footbridges. I LOVE little footbridges! It was really, really wet. One of my favorite sculptures ever. It shows what to do in each month. It seems that in February you fish, in March you prune trees, in May you go out marauding. In September you stomp grapes, in December you kill a pig. This trip was so momentous in so many ways that I need to split it up. There will be more…and soon. Can you cheat on a region? So it’s been years since I’ve posted. Literally. My bad. This creates a teachable moment about the power of habit that I’ll try to keep in mind, but it also reminds me why I suddenly stopped: I cheated on the Caribbean. 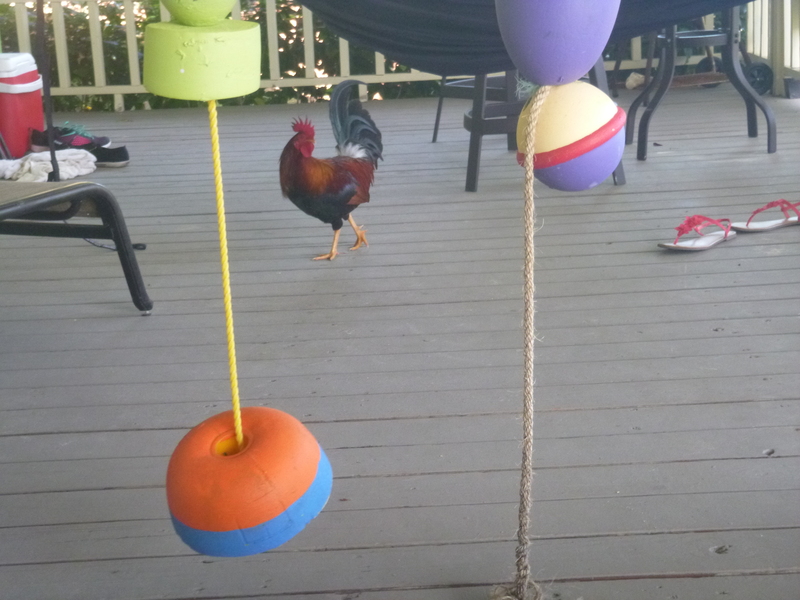 Shortly after we got back from Culebra, Buck started to get a little antsy because we didn’t have any trips planned. And when I say “shortly,” I mean a week or two. So I pulled up ITA Software and started getting busy and found nothing. I mean, it was going to be $800 to go almost anywhere we hadn’t been before. Bonaire or Curacao? Ouch. Barbados? Very pricey. Cayman Brac? Truly, outlandishly expensive. Name an island and it was going to drain the coffers. In a grumpy mood, I said “We could just go to Italy if it’s going to cost this much.” And so we did! Because I still had it in my head that this blog was about tropical beaches, I didn’t write about the process or about the trip. And then I got out of the habit. There have been a bunch of other cool things–there are some new discount airlines, we’ve done a lot in Western Pennsylvania (and even West Virginia), yada yada. I’m now formally repurposing I Felt Like A Gringo to cover all travel, even if it’s just a weekend at a local lake. Because that can still be interesting and service-y if you do it right, and I’m arrogant enough to think that I do it right. So there. More to come, and not in two years. Maybe not even two days. In a nutshell: this island is super-duper fun. But if you want details, read on! We were on Culebra in March and had an absolute blast. It’s a perfect mixture in a variety of ways: it’s very small but has enough activities to keep you busy for a week. It’s relatively undeveloped but has plenty of variety in terms of accommodation and restaurants. It’s incredibly laid-back and relaxing, but offers amazing outdoor adventures. In an earlier post I discussed the massive analytical task of figuring out what combination of big-plane flights and little-plane flights and ferries will get you to Culebra within a reasonable timeframe and budget. Even though we usually love ferry rides we took a little (tiny!) plane back and forth from San Juan and it was absolutely worth every penny, particularly for anyone who isn’t afraid of flying. It was the most exciting plane ride of our lives. 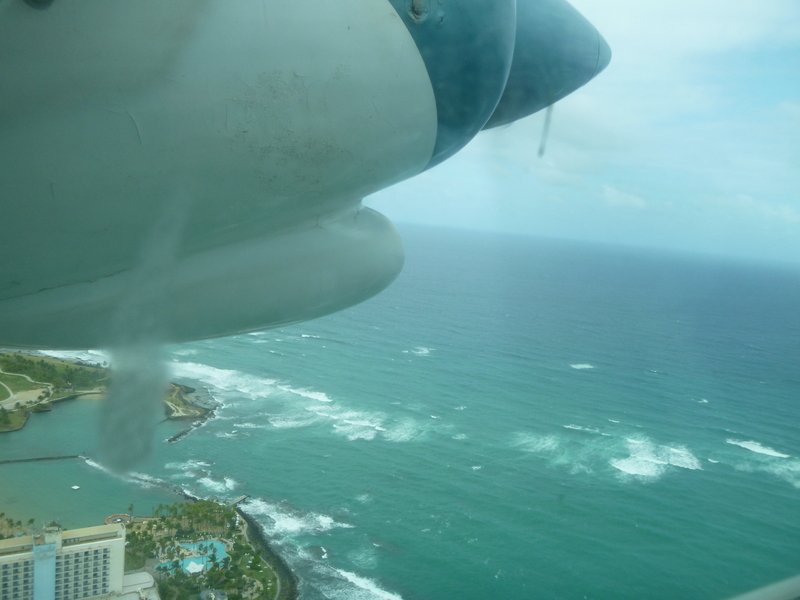 Leaving from San Juan, you fly down the northern coast of Puerto Rico, then make the crossing to Culebra by flying over a bunch of cays and turquoise water. The approach to the airport is over Flamenco Beach and between two mountains, then you bank sharply and land. The exciting part? It was windy. Very windy. The pilot had to judge exactly how much wind was coming from what direction and let it blow us onto the runway! We saw another plane land shortly after ours and it actually bounced a few times. 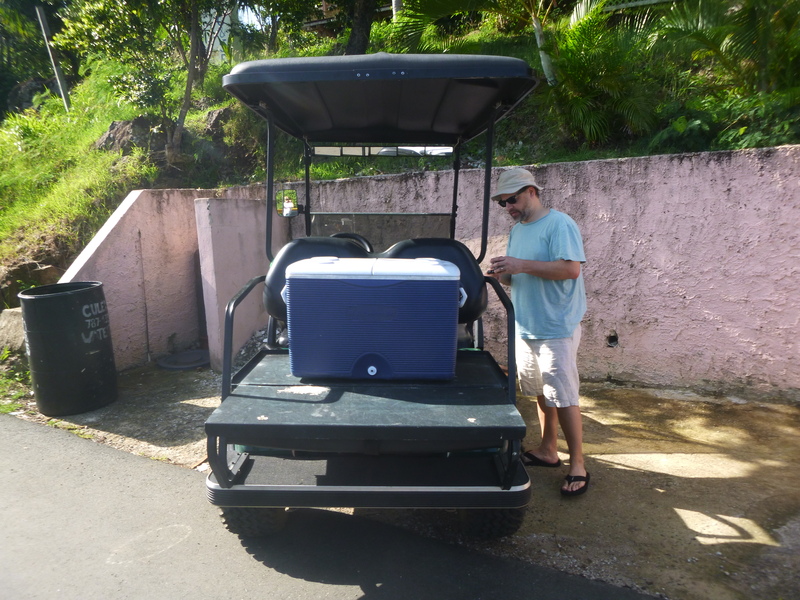 And for getting around…there’s a lot of debate on Culebra travel forums about Jeeps versus golf cart, and here’s my two cents. Unless you’re staying miles out of town or on a road where Jeeps are specifically recommended, or unless you have a large group that includes very young children, go with the golf cart. It’s cheaper and more environmentally sound. Parking is scarce and tight…unless you’re in a golf cart. Then you can squeeze in almost anywhere! It is incredibly, ridiculously fun. I had a huge, goofy grin on my face every time I got behind the wheel. And we did go pretty much everywhere in that thing, including the steepest roads with the biggest potholes. In the rain. I want one. Buck fastening the GoPro to the canopy. Check out the cooler fastened with bungie cords, our cargo carrier! We stayed in Green Villas Seastar in the Punta Aloe neighborhood, a mile or so down the road from the pueblo overlooking Ensenada Honda. I’ve already reviewed it on HomeAway, but I’ll talk a little bit more about Culebra lodging in general. For the budget traveler who doesn’t need stuff like pools and marble tiles, Culebra is a great place. There are lots of reasonably priced places with kitchenettes, and most of them have nice water views. Our view was seriously world class, and even though we had some bug issues I’d definitely consider staying there again because a) this view and b) what a fantastic location! It was exactly the right distance from the pueblo: far enough, but still close. Let me just say this up front: I get four weeks of vacation every year, and for the rest of my career I’d be happy to spend one of them stuffing my face in Puerto Rico. And when my career is over, I’d be happy to spend the coldest months there, gaining weight. We didn’t bother with fine dining even though there were a couple of places that qualified. We were happiest eating tacos and fish and churrasco. And sandwiches and street food. Frankly, it is pretty much my ideal diet, especially when there are a lot of strong drinks thrown into the mix. If I had a Star Trek transporter I’d go get one RIGHT NOW. Helados are like Italian ices, but you can get them in a huge cone. There was a cart at the beach that had coconut and mango and guava and passionfruit. 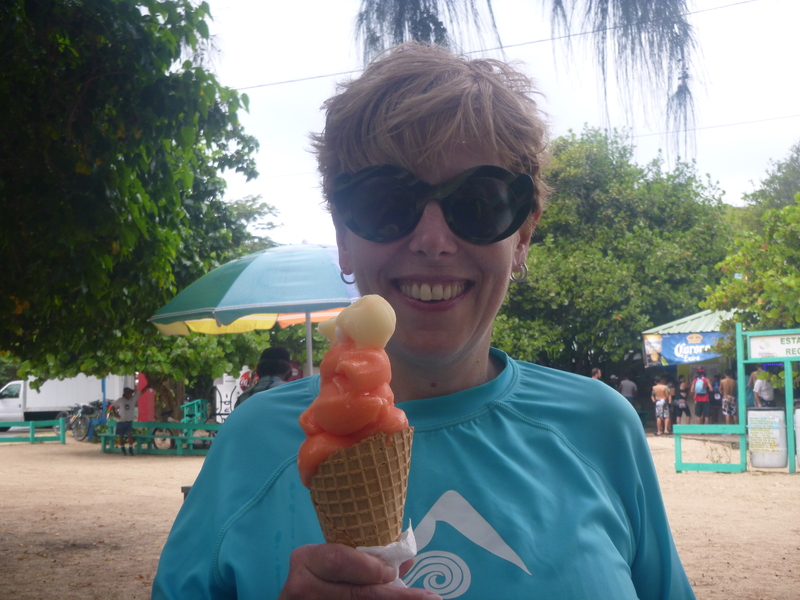 This one is a helado de parcha (passionfruit) but I’d like to go back (tomorrow would be nice!) and get half parcha and half guayaba (guava). Strangely enough, despite the location, we may have liked their churrasco and mashed potatoes better than anything else on the menu. The real gem, though, was the local bakery, Pan Deli. It gets crowded at breakfast because they sell delicious breakfast sandwiches and one of the best breakfast pastries ever: quesitos! Puff pastry stuffed with cream cheese, then drizzled with syrup or sugar or something that gets all crunchy. Oh my god, so delicious. Pan Deli also sells enormous inexpensive sandwiches that are great to pack up and eat at the beach. So, so good. Culebra has beaches that rival the best you’ll find anywhere, and Playa Flamenco deserves every bit of its reputation. It is an absolutely stunning, huge horseshoe of white sand with water exactly the color that you’d expect in a tropical paradise. Our weather was far from perfect—some rain most days, lots of wind, and very rough water. We spent a lot of time at Playa Melones because it seemed calmer and less rainy than other beaches, and we also hit Playa Tamarindo (both grande and pequeño). As usual, the rockier beaches had much better snorkeling than the postcard beaches. Big chunks of Culebra are a national wildlife preserve, with no fishing and no development. 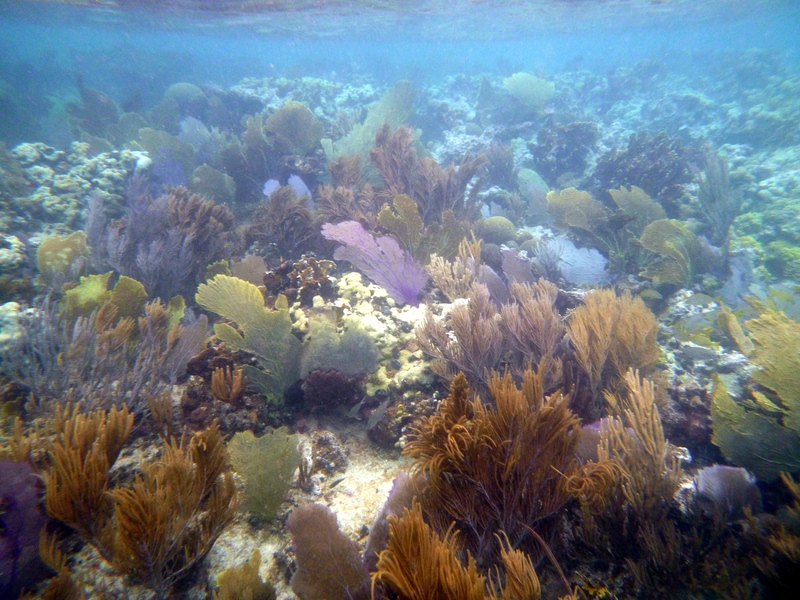 It shows under the water—lots of healthy reef, mostly featuring the biggest, most colorful seafan forests we’ve ever seen. About 20 feet off the beach at Playa Tamarindo Grande. Seriously, there were seafans everywhere, as far as the eye could see, except when there were also hard corals or when it switched to seagrass to make the turtles happy. And they take their turtles seriously in Culebra. Every beach had a “don’t pester the turtles” sign in English and Spanish. Seriously, don’t bother the turtles. Please. There were a bunch of places we didn’t go because of rough seas, but we spent an afternoon kayaking out to Cayo Luis Pena without landing out there because of high surf. I’d love to go back sometime like June, when the seas would probably be calmer, to swim and snorkel at Playa Zoni and Culebrita and Carlos Rosario without taking our lives in our hands. Kayak rentals are really reasonable, by the way—$45 for a double for half a day. Weather aside, we really didn’t get skunked on snorkeling at all. 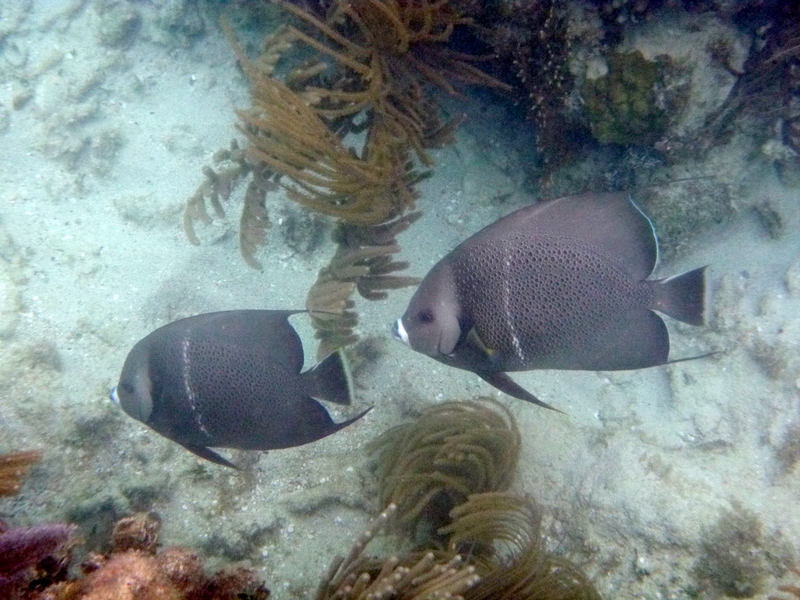 Aside from the seafans, just check out these grey angelfish! I’ve never seen two together at once, and these seemed to be buddies. I love their blue lips. Culebra has an interesting history—after being used as target practice for decades they kicked the Navy out in the 1970s through sheer force of will and nonviolent protest—and a really unique atmosphere. Everyone who lives there, whether they were born there or got there last month, is incredibly proud of it. 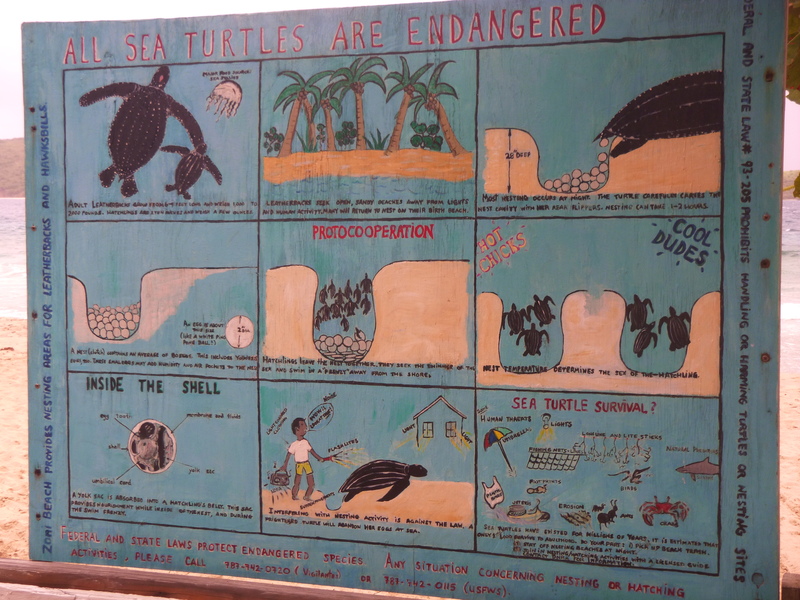 They’re proud of their unspoiled beaches, their mangroves, their turtles, their murals. They are really happy when you agree that it’s nicer than Vieques (“it’s more like the big island,” they say). It’s the kind of place where a little eccentricity is more than accepted. It’s welcomed. It’s celebrated. It’s a church camp, unfortunately…but with that view and a few circus tents I could get religion. The very first time we went to the Caribbean we camped at the Cinnamon Bay campground in Virgin Islands National Park, on the superlative island of St. John. It was a life-changing experience, to say the least—we spent five days truly stunned by beauty, our jaws agape, and have been back to the region multiple times every year since. We haven’t camped in the islands since then, but lately I’ve been thinking about going back because it was really great. Twenty yards from a perfect beach, amazing forest sounds, deer, iguana, hermit crabs scuttling around the undergrowth, geckos chilling on the tent…what’s not to like? On many islands it’s as close as you’re going to be able to get to the beach, and there’s nothing more romantic than taking a late night stroll on the sand looking for shooting stars with your sweetie. Plus there’s the cheapness. Even if you have to check extra bags you’re going to be saving some serious bucks. At Cinnamon Bay we spent a lot of time gazing at the (kind of tacky, IMHO) faux-Tuscan mansions on Peter Bay. We were on the same island. Swimming in the same water, although we were sleeping closer to it. We were spending around $55 a night (at that time, it’s gone up) instead of $2500 or more. It’s my strong belief that travel should be more egalitarian. If you can save up for the airfare, that’s pretty much always going to be the biggest part of your budget. If you need to sleep in a tent, at least you’re sleeping in a tent somewhere really cool. So put some money aside each payday and just go. So, without further ado, here is the first post of many on places to camp in the Caribbean. At some of them you need to bring everything. Others have tents (or Airstream trailers!) set up for you. Some of them are “eco-cabins.” Every single one of them will give you a truer, more authentic, more interesting experience than even the most luxurious resort. Cinnamon Bay Campground, St. John: Cabins, platform tents, baresites, group camping. Cabins and platform tents come with basic cooking equipment and propane stoves; baresites can rent that stuff. There’s a store, a restaurant, and watersports on site, on the longest beach on the prettiest of the U.S. Virgin Islands. Look out, the showers aren’t heated! Concordia Eco-Resort, St. John: The Maho Bay Resort on St. John pioneered sustainable tent-cabins, but unfortunately someone else owned the land and they were kicked out a couple of years ago. The same person developed the Concordia resort in a very secluded spot on the other side of the island. It’s not cheap (higher than our usual even in the offseason) but if you want to see how it’s done this would be a great place to try. Virgin Islands Campground, Water Island: Also not cheap by our stringent standards, but pretty nice. Water Island is just off of St. Thomas with regular ferries, but seems to be a world away from what is a fairly urbanized island. 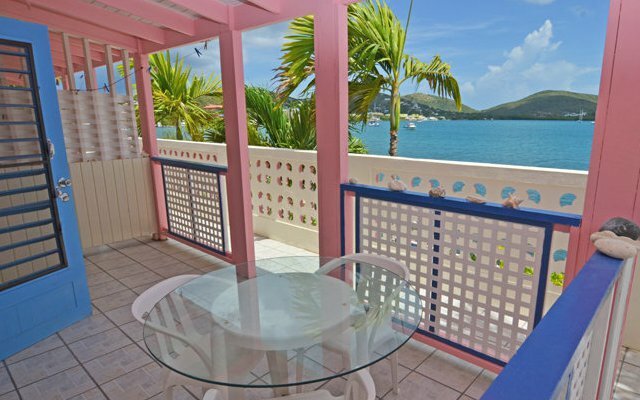 Cane Bay Campground, St. Croix: When we went to St. Croix we considered this option very carefully: nice little screened cabins extremely close to a gorgeous beach, perfect for snorkeling, diving, and liming. These people also run a kayaking company for trips to the Salt River Bio Bay. 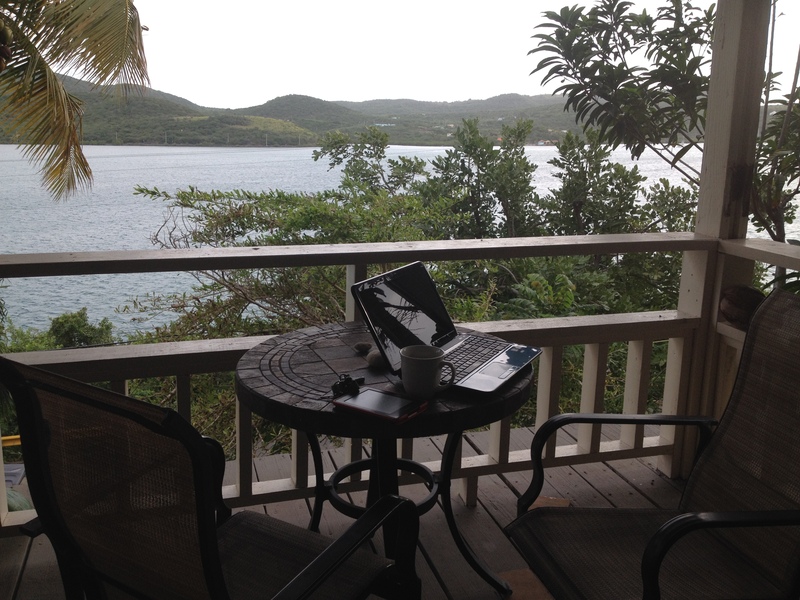 Ridge to Reef Farm, St. Croix: Stay in a tent or cabin on an organic farm in the tropics. They say you can volunteer to work on the farm…not sure whether it’s expected that you’ll be an unpaid farmhand. If you don’t spend much time weeding in your real life, you might love it. Mt. 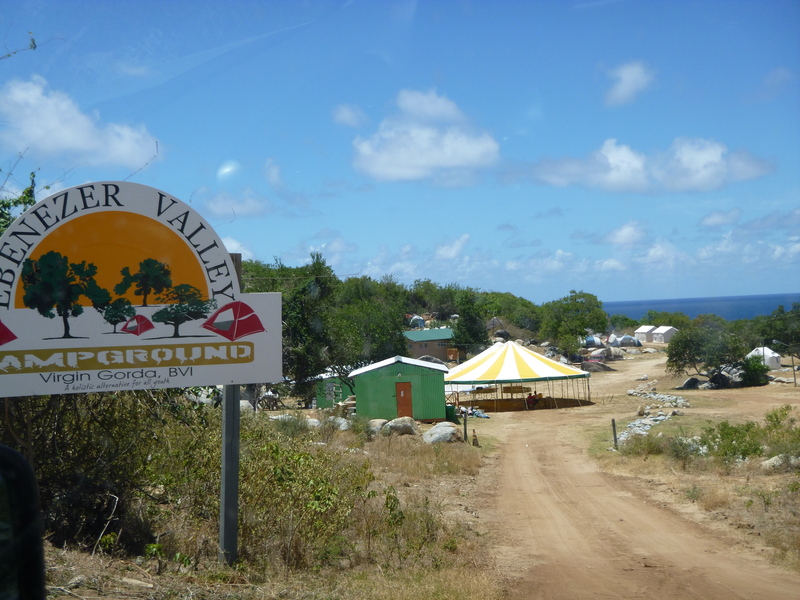 Victory Camp Eco-Lodge, St. Croix: Another really cool group of cabins with baresite camping available. St. Croix rocks. These people run workshops on tropical skills and survival, which could be interesting, I guess? As a travel blogger I’m a bust. The best bloggers are committed. They post all the damn time. I guess that’s just not me. And I’m not going to make any excuses about all of the other things happening in my life because I spend at least a half hour every day just wasting time. Villa Fulladoza was all booked so we went with Seastar at the Green Villas. I’m pretty excited about it…the owner has been friendly and helpful and knocked a night’s rent off the price, which is very satisfying to my inner frugal person. We’ve also finalized our transportation plans. When I booked the trip I thought we would be able to rent a Volkswagen Thing. I have wanted a Thing since before I could drive. I’m totally comfortable with driving a rickety stick-shift vehicle in mountainous terrain–after all, I spend a lot of time in Pittsburgh in an uninspected 1998 Golf–but they’ve stopped renting the Things! I guess they got to the point where they couldn’t keep them on the road. I am very disappointed that we’re six months too late. But we are renting a golf cart! I am foolishly excited about this. It’s the next best thing, really. If you ever want to go to Culebra (or Vieques, for that matter), there are only two ways to get there unless you charter a yacht: ferry or eight-seat puddle-jumper. The ferry is the budget option: it costs less than $10 after an $80 cab ride to Fajardo. There are frequent delays and you can get bumped because it’s really there for the people who live on the islands (after all, every now and then you need to go to a real store). Even so, we would have taken the ferry because ferries are fun, but the times just weren’t working for us. The afternoon ferry was a little too early and then we would have had to have waited until 7:00 p.m. and gotten there after dark. Coming back, the only ferry that would have worked was for commuters and left at some ungodly hour like 6:00 a.m. This was a surprisingly difficult analytical task that worked best with a spreadsheet. What combination of flight schedules, airports, and airlines would get us to and from Culebra at the best times and at a reasonable price? There were hundreds of possible combinations but we ended up buying tickets on Vieques Air Link from Isla Grande for the arrival date and Cape Air to SJU for departure. So now we’re less than a month out and all we’ve got to do is wait. We’re passing the time by thinking about excursions (definitely want to go to Culebrita, might want to kayak to Cayo Luis Peña) and food. I am dying for pinchos and empanadas. I’m still investigating Culebra properties to amuse myself as the weather in Pennsylvania veers wildly between unbearable and less unbearable. Villa Fulladoza checks off a lot of boxes. Really, really oceanfront? Check. Convenient location in case we have too many rum punches? Uh huh. Excellent outdoor space for lounging with coffee in the morning and a drink after the beach? Oh my, yes. Incredibly inexpensive? Yep. There are some things I don’t love about it. It’s more hotel-like than most places we stay, with seven apartments instead of just a few, and that might make it noisy or otherwise annoying. Reviews of their WiFi are less than stellar and it’s a necessity for me at this point. But it’s still in our top three and the view and handy location (and ridiculously cheerful colors) may win out.